We spent last year doing a year-long world geography study and discovered the importance and the fun of map work. Knowing where important events in history occurred helps make learning much more concrete so this year, we are continuing to use maps for both Bible and history. 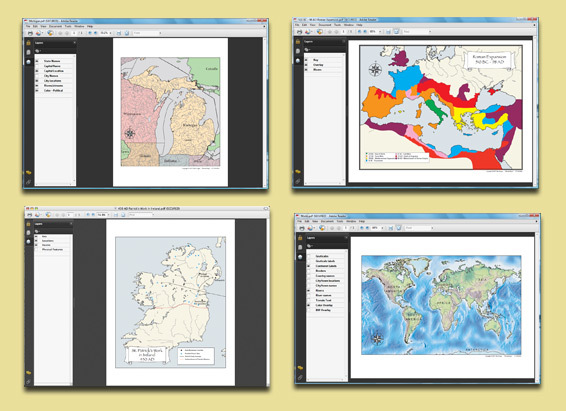 WonderMaps also includes the complete map sets for The Mystery of History vol. I-III and All American History vol. I and II. There are so many things I am planning to do with these maps. First, we're studying about Joseph in our Bible study. One of the historical maps is of Joseph and his brothers. I printed the map with just the cities labeled and had the older kids draw the journeys of Joseph and his brothers to match the key on the map. I can't wait to do similar things with the historical maps as we continue through our study of Rome to the Reformation in history and as we study through the Bible. I printed out some continent maps with just country outlines for the kids to color/label depending on their ability level. I also am teaching a world geography class in our homeschool co-op this year. These maps will be very helpful tools for this class. WonderMaps will work on both PC and Mac and requires Adobe Flash Player 9.1, which is a free download. WonderMaps can be purchased at Timberdoodle for $44.95, a great price for everything you can do with this software. If you are interested in other hands-on geography or geography puzzles, you should definitely check out Timberdoodle. Check out their Facebook page or request a free catalog. Review disclosure: As a member of Timberdoodle's Blogger Review Team, I received a complimentary copy of WonderMaps in exchange for a frank and unbiased review.